The hotel is named after Ananda, an ancient Sanskrit word that means the state of deepest spiritual satisfaction, joy and supreme happiness. 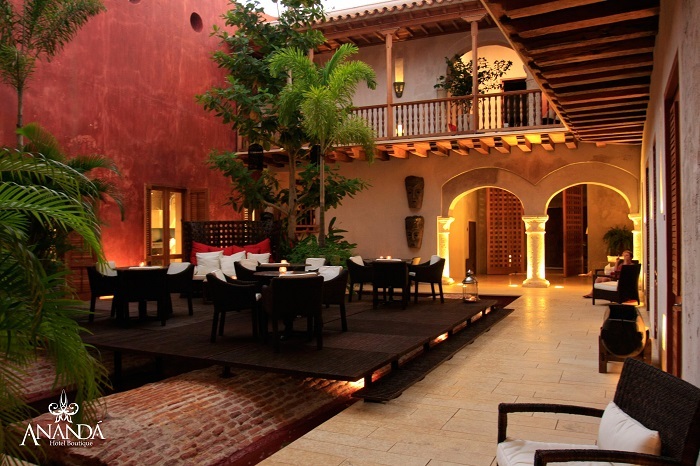 Ananda Hotel Boutique is located in the heart of the walled city of Cartagena de Indias. A short distance away, you will find important monuments and historical buildings such as the cathedral, the Plaza Santo Domingo and the Palace of the Inquisition. The vibrant life of the streets, fashion boutiques, art galleries, and gourmet restaurants all beam with a warmth and friendliness that transport you to the 16th century. Around the corner, you will find the wall that once defended the city from pirates, thieves, and buccaneers. This same location, centuries later, has transformed into one of the most romantic places in the world. The following discounted rates have been negotiated with Ananda Boutique Hotel for our guests. Below you will find the rates per night according to different types of rooms. To reserve please send your inquiry via email to Maria Alejandra Gonzalez at alejandra_gonzalez@anandacartagena.com or reservas@anandacartagena.com and reference "Matt & Ximena Wedding" in the subject.